Stacey Abrams’ New Georgia Project shocks Georgia’s GOP: Republicans fighting minority voter drive with voter suppression. Georgia’s Democrats have registered more than 85,000 minority voters (and counting). Republicans never saw it coming. Board of Elections Customer Service Supervisor Sabrina German hands out absentee ballots during early voting on Oct. 23, 2008, in Savannah, Georgia. If more minorities register and vote, Georgia could be a red state no more. Enter the New Georgia Project. Led by Stacey Abrams, Democratic leader in the state House of Representatives, the project is meant to do just that—register hundreds of thousands of blacks and other minorities. 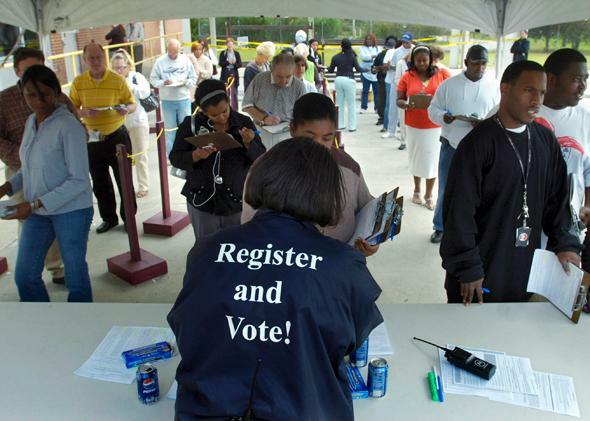 Their goal, says Abrams, is to “directly or indirectly collect 120,000 voter registration applications.” That could be enough to push Democrats over the top. And it makes the project one of the largest voter registration drives in recent Georgia history. So far, it’s been a success. “In addition to the 85,000 we have collected as an organization directly,” says Abrams, “we have also supported the efforts of 12 organizations around the state. We know there are groups doing registration in the Latino community, in the Asian community, and in the youth community, and we wanted to support their efforts as well.” These groups, she says, have collected 20,000 to 25,000 applications, putting the New Georgia Project in striking distance of its goal two months before Election Day. Which brings us to this week. On Tuesday, Georgia Secretary of State Brian Kemp—a Republican—said his office was investigating allegations of voter fraud from the New Georgia Project, following complaints about voter applications submitted by the group. To that end, Kemp has issued subpoenas to the group and its parent organization, Third Sector Development. “Preliminary investigation has revealed significant illegal activities’ including forged voter registration applications, forged signatures on releases, and applications with false or inaccurate information,” he wrote in a memo to county election officials. She’s right. “A private entity shall promptly transmit all completed voter registration applications to the Secretary of State or the appropriate board of registrars within ten days after receiving the application or by the close of registration, whichever period is earlier,” says the Georgia Secretary of State’s Office website. Nowhere are private organizations asked or required to filter or discard applications. There’s little information on the scope of the alleged fraud. But there is an aggressive subpoena that, Abrams says, “essentially demands every document we have ever produced.” She calls it a “fishing expedition” meant to “suppress our efforts.” A spokesperson for the New Georgia Project, the Rev. Dr. Raphael Warnock of Ebenezer Baptist Church, was a little more explicit. “I see this move by the secretary of state as the latest effort in voter suppression in the state of Georgia,” he said. Kemp insists that this investigation is impartial and nonpartisan. “At the end of the day this is not going to be about politics,” he told a local reporter. “This is about potential fraud which we think happened.” At the same time, Abrams and Warnock are rightfully suspicious. Not only was Kemp a vocal supporter of the state’s divisive voter identification law, but he’s a Republican in a state where the GOP has worked hard to dilute the strength of black voters. Under the old Voting Rights Act, Georgia officials had to clear voting changes with the Justice Department, and for good reason: The state had a long history of disenfranchisement, and “preclearance” was a way to pre-empt discrimination or prevent it entirely. Likewise, officials in rural Greene County implemented a redistricting plan previously blocked by the Justice Department, and lawmakers in Morgan County floated a plan to eliminate half the area’s polling sites, a move that would have its greatest effect on low-income and minority voters. Against this backdrop of voter suppression, it’s no surprise Abrams is suspicious of the state’s investigation: From the harsh accusations of “fraud” to the aggressive actions from Kemp, it looks like another attack on efforts to increase participation and diversify the electorate. With that said, there’s only so long Republicans can hope to win through such divisive methods. Six years ago, a “purple” Georgia was a pipe dream. Now, in a year when Republicans have the national advantage, it’s a possibility. The pace of demographic change is so fast that, soon enough, Democrats like Abrams won’t have to work to change the electorate—it will have happened on its own.